Fresh Coat of Paint: Saving For a Home? Learn from this Inspirational Young Canadian! Saving For a Home? Learn from this Inspirational Young Canadian! 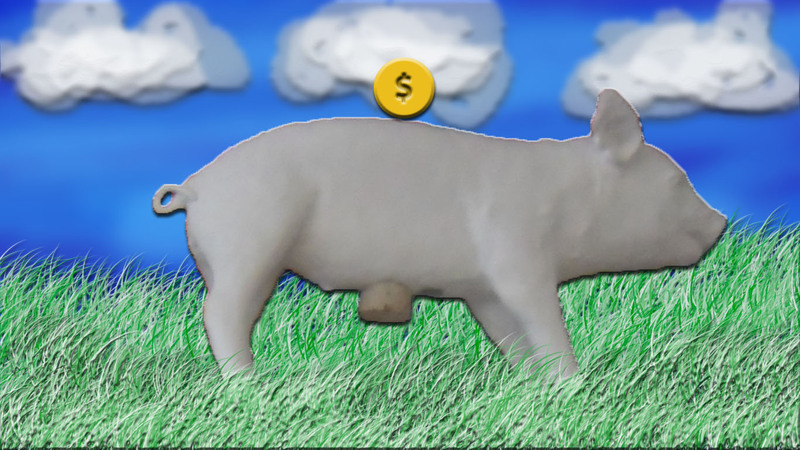 Yes, that's our Harry Allen piggy bank (badly) photoshopped in the picture. He helps us save our toonies for vacation add-ons. It works well because he's just mean looking enough to deter us from uncorking him when we need extra change. Also, when we got him, Barkley hated him and would growl at him. Hilarious! So this is my introduction to a blog post which is mainly about saving. I would never be able to make this topic interesting on my own, so I'm referring you to the blog of a talented young woman who writes engaging, light articles about her own experiences with debt and savings. Many young people are faced with real estate challenges that past generations never had. In Toronto, the average price for real estate has risen much faster than the average salary. The good news is that interest rates are lower now than they were when our parents purchased their first homes. This means that more of your monthly mortgage payment is applied towards your principal. Unfortunately, higher prices also mean it takes longer to save for a down payment. While there are cash-back mortgage options available through some lenders, nothing beats good, old-fashioned saving. I recently came across a blog written by an inspirational young Vancouver woman named Krystal Yee. She is published in Moneyville, The Toronto Star and basically all over the place but her articles are realistic and refreshing and I feel that she has a very clear way of thinking about savings. Krystal was in debt and she explains bravely that it was both from student loans and from shopping. She has embarked on a quest to become financially comfortable and is well on her way. Her blog, Give Me Back My Five Bucks is written with honesty and humour and I recommend reading a few articles for her tips. In How I Saved for my Down Payment Yee explains her debt situation a little. She also mentions the challenges of wanting to purchase a townhouse at the time in Vancouver's pricey real estate market. She talks about eliminating all debt and then building her budget backwards. In the end, she chooses a less expensive home to save on monthly payments. In How I Plan on Destroying My Mortgage (don't you just love the title?) She walks us through her thought process as she examines the different mortgage options available to her. She is also very conscious that she does not want her mortgage payments to affect her RRSP contributions. She is always thinking long term and has built a sustainable plan. Smart girl!